Beer buff and blogger Matthew Gaughan shared his passion for Belgian and Belgian-inspired beers and offered an illuminating insight into their complex world. Although I don’t drink beer very often I’ve always enjoyed the Belgian beers I’ve tasted, albeit without knowing very much about what was in my glass. Before looking at the specific characteristics of Belgian beers, it makes sense to have an appreciation of the beer brewing process and of the influence that each stage and each ingredient has upon the finished product. Beer has been brewed for at least 8,000 years and its basic ingredients are water, a source of starch that can be fermented (usually a grain), yeast and a flavouring (such as hops) to offset the sweetness of the starch source. The majority of beer is water and the differing mineral content of waters from different regions means they are better suited to certain styles of brewing. Dublin’s hard water is ideal for stout whereas the soft water of Pilsen makes excellent pale lager. The gypsum present in the water of Burton-Upon-Trent benefits the production of pale ales as it accentuates the flavour of the hops. For this reason brewers of pale ales elsewhere add gypsum to their water in a process known as Burtonisation. Malted grain is the most commonly used source of starch for brewing beer, with malted barley usually making up the major proportion of the grain used. Grain is malted by soaking it in water and by allowing it to begin to germinate. Unlike the grapes used to make wine, grain contains starch rather than easily fermentable sugar and this starch must be converted into sugar before the beer can be made. Germination triggers the production of the enzyme amylase that facilitates this conversion, and much of the popularity of barley is due to its fibrous husk being a particularly rich source of amylase. The malted grain is dried in kiln to halt germination and the extent to which the grain is roasted directly affects the colour and flavour of the beer. Hops, the flower cones of the hop vine, have several characteristics that brewers require: they provide a balancing degree of bitterness; they provide citrus, floral and herbaceous flavours; they have antibiotic effects on micro-organisms that might spoil the fermenting beer and they improve the lifespan of the beer’s foamy head. Before hops were widely cultivated beers were flavoured with plants and herbs, but from the thirteenth century the use of hops gradually took over. Yeast is the single cell powerhouse responsible for fermentation. It does this by metabolising the sugars released by the malting process and converting them into alcohol and carbon dioxide. Fermentation used to be performed by wild, airborne yeasts until the role of yeast was properly understood; the pure, cultured strains of yeast used today were pioneered by Carlsberg and were first introduced at its brewery in 1883. Aside from alcohol and carbon dioxide, yeast also supplies a great deal of flavour as it produces numerous flavour compounds during fermentation and maturation that include fruity, spicy and medicinal notes. Having decided which ingredients to use, these now need to be transformed into beer. Once the barley has been malted and kilned, it is milled to expose the cotyledon at the core of each grain. This is where the majority of the grain’s carbohydrates and sugars are stored and milling makes them more easily accessible during mashing. The milled malt is mixed with hot water to create a cereal “mash” and the enzymes released during germination get to work on converting the grain’s starches into sugars in a process called saccharification. These sugars dissolve in the hot water of the mash forming a rich, sugary liquid known as “wort”. The wort is strained (“lautering”) and is transferred to a large kettle where it is boiled with hops and any other herbs, spices or sugars the brewer desires. At this stage many important decisions about the colour, aroma and flavour of the beer are made. After the wort is boiled, most of the solid elements are allowed to settle out in a vessel known as a whirlpool before the liquid is rapidly cooled in a heat exchanger. Once the cooled wort reaches a temperature that is not too hot to kill the yeast, it goes into a fermentation tank where the yeast is added to allow the fermentation to begin. There are three main methods of fermentation: warm, cool and wild or spontaneous. Brewing yeasts were traditionally classified as either top-fermenting or as bottom-fermenting because live yeast was collected from the top or bottom of the respective vessels of fermenting wort to use for the next batch of beer. Modern mycology discovered that these two collection methods actually involve two different species of yeast, each of which prefers a different range of ambient temperatures to work in. Saccharomyces cerevisiae, the same species of yeast used to make bread and wine, is the yeast species responsible for top-fermented beers and it operates at warmer temperatures (16°C and higher). Top-fermenting yeasts are used for ales, stouts porters, wheat beers and others. Although they are ready to drink within three weeks of the start of their fermentation, often they are conditioned or re-fermented in tank, cask or bottle for quite some time subsequently. Saccharomyces pastorianus is the yeast used for bottom-fermented beers and it prefers to work in cooler temperatures (5-10°C). The fermentation is slower in this colder environment, producing fewer of the aromatic by-products found in warm ferments and resulting in a cleaner, crisper flavoured beer. Lager, which represents most beer produced today, is fermented before being conditioned or stored (“lagern” means “to store” in German) at a temperature close to freezing point for several weeks or months to mature until it is ready to drink. It is said that top-fermented beers are flavoured by yeast, whereas bottom-fermented beers are flavoured by their ingredients. The fruity esters and spicy flavours produced by yeast that are apparent in ales are muted by cooler ferments and by the lagering process, highlighting their cereal and hop characters instead. Wild or spontaneous fermentation is specific to the brewing of lambic beers in the Pajottenland region of Belgium and it progresses without the addition of cultured yeast. The worts are fermented in oak barrels by a wild yeast, Brettanomyces bruxellensis, and by up to eighty other micro-organisms native to the Zenne valley. To prevent spoilage by rampant microbes that flourish in the summer heat, lambics are fermented from October to May when the weather is cooler. In their purest form, lambics are flat as oak fermentation barrels do not retain sufficient pressure to force the carbon dioxide to dissolve into the beer. This unusual fermentation method provides lambic beers with their unique dry, vinous, cidery and sour character. Most lambics are blended and bottle conditioned to produce gueuze, re-fermented with morello cherries to produce kriek or re-fermented with other types of fruit to produce one of Belgium’s famous fruit lambics. After its initial fermentation, beer is conditioned in various ways over varying periods of time, ranging from weeks to years. This can be either a maturation or ageing process (such as lagering) or it can involve a second or third fermentation in cask or bottle to boost the carbonation and to increase the complexity of the beer. Such cask or bottle conditioned beers can also then be aged to allow an evolution of their aromas and flavours. The Belgians have retained more of their historic and idiosyncratic brewing traditions than any other country and their beers have inspired large numbers of brewers around the world. Originally provinces of the southern Netherlands, the territory that was to become Belgium was successively ruled by the Spanish, by the Austrian Habsburgs, by the French and by the Dutch once again before eventually gaining independence in 1831. Post independence, the monasteries that were destroyed during the French revolution reopened and rebuilt their breweries. They produced beers from oats and wheat as well as from malted barley, in styles that ranged from sweet to dry to sour. In 1919, a law was passed banning the sale of distilled spirits in bars and cafés that wasn’t rescinded until 1984. As a result, Belgian brewers upped the strength of their beers to meet the demand for more robust drinks. Around the same time, the Trappist monks began to brew complex, stronger beers to sell to support their work and these proved to be so popular that they were, and still are, widely imitated. Most beer sold in Belgium is the same pilsner/lager style found the world over. When we talk of Belgian beers we refer to the stronger, top-fermented concoctions this small nation has made so famous. What, therefore, makes Belgian beers so distinctive? There is not one simple answer to this question as a number of factors are involved. One important factor is yeast. Over the course of centuries, brewers have traded strains of yeast between breweries and certain areas began to express what is best described as a terroir of fermentation. Top-fermenting yeasts produce rich, fruit and spice flavours as they work on the strong worts at the high fermentation temperatures often used in Belgium. Some Belgian beers may have a suggestion of sweetness, but they are generally fermented to leave very little residual sugar and they have relatively low levels of hoppy bitterness as this would overemphasise their dryness. Malt is another facet of Belgian beer’s character. Many are made with pale, pilsner malt; wheat is used for witbiers and lambics; oats, spelt and other grains are also sometimes added. Spices such as coriander, star anise, black pepper, grains of paradise and orange peel can be used to provide background flavour. Unlike British and other dark beers, Belgian dark beers (dubbels) are not made with darkly roasted malt but with pilsner malt and very dark candi sugar, an inverted sugar in liquid form. Instead of providing the coffee and chocolate flavours of dark malt, the use of dark candi sugar gives dried fruit and crème brûlée notes. Because candi sugar is easily fermentable, beers brewed with it are often high in alcohol yet are deceptively easy to drink. Tripels and strong golden ales are made with paler coloured, less caramelised candi sugar that lightens the flavours of these strong beers whilst allowing them to ferment to dryness. Bottle conditioning, the secondary fermentation method perfected by the Champenoise, gave bubbles to beer before wine and is used more in Belgium than anywhere else. Some Belgian beers are partially carbonated in tanks prior to bottling and to experiencing a degree of re-fermentation, but the best beers obtain all of their fizz during their period of bottle conditioning. These end up being highly carbonated giving them a copious, foamy head and a creamy, soft mousse. Often, Belgian beers are poured into brand specific, distinctively shaped glasses to preserve their aromatic complexity and their carbonation, but they should be poured carefully so as not to disturb the sediment of dead yeast cells that remains in the bottle after the secondary fermentation. Within the realm of top-fermented Belgian beers reside a number of different styles and categories. Strong pale ales are the Belgian versions of the British India Pale Ales made at varying strengths and displaying fruitier, yeast-derived flavours rather than the malt and hop characters of their cross-Channel cousins. Dubbel or double is a very popular and recognisable style of dark, strong Belgian beer invented by the Trappist Westmalle brewery. Made with dark candi sugar, dubbels are dry but can taste slightly sweet due to the restrained use of hops. Top examples are bottle conditioned, they generally have a strength of between 6.5 and 8% alcohol by volume (ABV) and they are very well balanced. Tripel or triple is a strong, golden coloured ale first commercialised by the De Drie Linden brewery in 1932. The terms “dubbel” and “tripel” refer to the amount of malt with fermentable sugar and to the original gravity (a measure of the solids content) of the wort prior to fermentation. Made with up to 20% candi sugar, tripels have multiple additions of hops to balance their richness. Again, the best are bottle conditioned, range from 8 to 11% ABV and are dry, complex and highly carbonated. Despite their alcoholic content, they are very refreshing and they slip down with alarming ease. 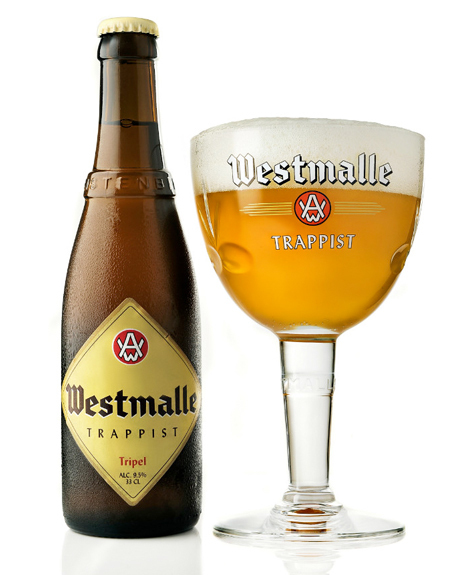 - the beer must be brewed within the walls of a Trappist monastery, either by the monks themselves or under their direct supervision. - the monastic community determines the policies and provides the means of production. The brewery must be of secondary importance to the work of the monastery itself and it must be run with business practices proper to a monastic way of life. - the brewery cannot be a profit-making venture; income is used to cover the living expenses of the monks and the maintenance of the monastery grounds and buildings. Any profit must be used charitably to benefit the needs of the community or for social services. Retfers is a lighter type of beer brewed by Trappist monks for their own consumption as the beers they brew to sell are rather strong and drinking them would interfere with their prayer and work. These are sometimes referred to as enkel or single, following the naming tradition set by dubbel and tripel beers. Dubbel and tripel are the styles of beer for which the Trappists are best known, but beers produced commercially in similar styles and connected to a religious order (even if only by name) are known as “Abbey beers”. Dubbel and tripel are terms that anyone can use for beers of the relevant style. There are other production methods used for other styles of beer, both in Belgium and elsewhere, but it’s time to look at some fantastic examples of the styles I’ve mentioned. Founded in Antwerp in 1833, De Koninck is now the only remaining brewery within the city and it was incorporated into the Duvel Moortgat group of breweries in 2010. 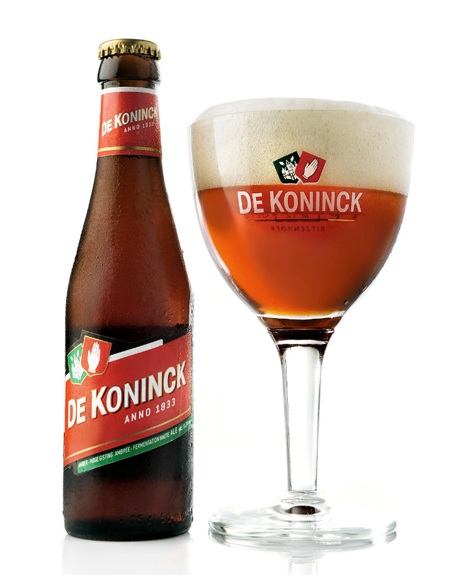 This warm fermented (25-27°C) beer is made with organic Czech Saaz-Saaz hops and should be poured with a creamy head into a distinctive spherical De Koninck “bolleke” glass. Deep amber with a toasty, malty, caramel and cocoa nose. Soft and creamily textured and not overly fizzy, the caramel and toasted malt characters from the nose carried through to the palate. A hint of spice and hoppy bitterness balanced the touch of sweetness, the finish had moderate length and overall it was a very easy drink, reminiscent of a British ale. Inspired by many trips to Belgium and by a shared love of bottle conditioned beers, Duncan and Keri Barton founded TicketyBrew just over 18 months ago in the east Manchester town of Stalybridge. Their aim was to create interesting beers based upon the best brews from around the world, using Belgian yeasts to develop complex flavours. A little more golden colour than the De Koninck, with a grassy, grapefruit citrus nose. Summery, floral and faintly smokey, with a touch of sweetness and fruitiness. Refreshing and very pleasant, but for me it just lacked a little bite and it finished a bit short. The monastery in Westmalle (officially called Abdij Onze-Lieve-Vrouw van het Heilig Hart van Jezus) was founded on 6th June, 1794, eventually being elevated to the status of a Trappist abbey on 22nd April, 1836. That same year, abbot Martinus Dom constructed a small brewery to enable the monks to drink the popular beverage of Flanders with their meals. On 10th December, the monks drank their first Trappist beer with their lunch. This first beer was described as being light in alcohol and rather sweet. Initially the monks consumed the entire production and it wasn’t until 1856 that they occasionally began to sell some beer at the abbey’s gates. By this time they had begun to brew a second beer, a strong, brown beer now considered to be the first dubbel. Demand increased quite quickly and the brewery was expanded, first in 1865 and again in 1897. In 1921, the monks decided to sell their beers commercially and, in 1933, a completely new brewing hall, yeast room and workshop were constructed. A third style of beer was created in 1934 and, since their second beer was called a dubbel, they called this stronger, pale ale a tripel. The brewing facilities were computerised in 1991 and the latest bottling plant was added in 2000. Because the demands of the operation were taking so much of the monks’ time the majority of its workers are now secular staff, although this has not affected the quality or the ethos of the brewery. This continues to ferment for three weeks after bottling and it will continue to change and evolve over several years. Gold in colour, the palest so far, and very slightly cloudy probably due to the way it was poured. White grapefruit citrus and coriander spice carry through from the nose into the soft, creamy, palate; a nice prickle of CO2 combined with a hoppy bitterness to keep it fresh and balanced. Complex, rich and with a long, dry finish - an archetypal strong pale ale. Excellent stuff! The history of the Brouwerij Van Steenberge in Ertvelde dates back to 1784, a time when many people brewed beer for their own consumption as it was safer to drink than water. The brewery thrived and, after the First World War in 1919, there was substantial investment in equipment and a number of beers were successfully introduced. In 1962, the decision was taken to refocus on top-fermented beers with secondary fermentation allowed to occur in the bottle. Piraat was added to the line-up in 1982 and it has been winning awards ever since. 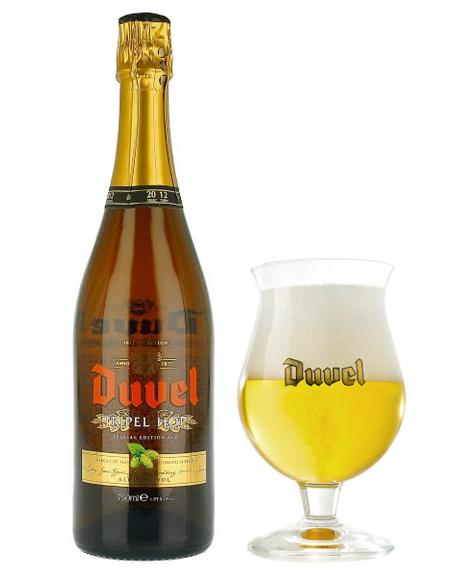 This was a classic Belgian strong golden ale, a style pioneered by Duvel. Very foamy when poured, hence the shape of the Piraat glass which maintains the head and preserves the aromas as well as showing off the bright amber colour of the beer. Savoury and slightly tart on the nose; fresher, hoppier and spicier than the Westmalle. On the palate it was fizzier, livelier and more malty with a well judged hoppy bitterness. The sweetness of the alcohol balanced and softened the bitter, spicy and malty notes, giving a long and linear finish. Just as excellent as the Westmalle and I bought bottles of both of them there and then! Jan-Léonard Moortgat and his wife founded their eponymous brewery in 1871, and their top-fermented beers were soon greatly appreciated both in their native town of Puurs and further afield. Even the Brussels bourgeoisie was won over. The First World War brought Belgium into contact with England and also with its ales, and these inspired Jan-Léonard’s son Albert to create his own version. Wanting to use only the very best ingredients, Albert visited England to obtain the specific strain of yeast he required. The English brewers he visited were unwilling to provide him with the yeast sample he wanted, although his luck eventually changed when a Scottish brewery shared its yeast with him. Such was the value of this prize that the same strain of yeast is still used to brew Duvel to this day. It was in 1923 that local shoemaker, Mr. Van Der Wouwer, was so impressed by the aroma of this innovative new beer that he exclaimed, “This is a real devil (duvel)!” The name stuck, despite the devoutly Catholic nature of the Flanders region at that time. In the late 1960s, the third generation of Moortgats decided that their unique beer deserved a unique glass and the Duvel glass was born. This was the first tulip shaped beer glass, able to hold the contents of an entire 33cl bottle with a rounded base to best present the complex flavours and a narrow top to retain the carbonation and preserve the head. Not only are these glasses still offered for sale by the fourth generation of the Moortgat family who now run the company, but its design has been imitated by brewers of similar styles of beer. Noticing a trend for more hoppy beers, Duvel originally brewed a limited release triple hop beer in 2007, then again in 2010. These original versions were made with the two varieties of hop usually used for Duvel, Saaz-Saaz and Styrian Golding, before being dry-hopped with a third variety: Amarillo. Dry-hopping involves the adding of hops again after the main fermentation, extracting the intense aromas and flavours of whichever variety is used. From 2012, it was decided that a different type of hop would be used each year for this dry-hopping process. The Citra hop, developed as recently as 2007 and cultivated solely in Washington State, was chosen for this particular vintage and it is renowned for its pronounced grapefruit character. Strongly perfumed, displaying bright aromas of tropical fruit, pithy grapefruit and coriander seed. Equally distinctive on the dry palate, with all of the hoppy bitterness you might expect. It is possibly because of the dryness resulting from the pronounced use of hops that the alcohol was a little more noticeable than it had been in any of the previous beers tasted. Not at all unpleasant and what I can only describe as a very international style of beer. To use a wine analogy, it most closely resembled a New Zealand Sauvignon Blanc in that its tropical pungency would make for a brilliant apéritif but I would struggle to pair it with food. Saisons (“seasons”) are hearty farmhouse ales, traditionally brewed over the winter to be drunk by the farm labourers during the hot summer months. As a result, saisons are very dry and refreshing beers with fruity, spicy complexity. The signature spiciness of this saison is believed to be the action of Brasserie Dupont’s unique strain of top-fermenting yeast which operates at temperatures as high as 35°C and which some people believe to be a red wine yeast that has been adapted to beer fermentation. Golden coloured, with an unusual savoury, spicy and smokey nose that most reminded me of lightly smoked frankfurters. Bready aromas also emerged in the glass. The palate, too, had a bready character with caraway and black pepper very noticeable on the finish. The hoppy, spicy character has led to this beer becoming very popular in America recently, with one publication even hailing it to be the best beer in the world. I’m not sure I’d go that far, but it was extremely drinkable. Located inside the Abbey of Notre-Dame de Saint-Rémy, near the town of Rochefort, the Trappist monks have been brewing beer since 1595. The current brewery was founded in 1899 and it is not open to the public - the monks are very secretive about their processes, hence very little information is known. Approximately fifteen monks reside at the abbey and the beer is brewed with water drawn from a well within the monastery itself. It is said that all three of the Rochefort beers are brewed to the same recipe and that it is only the conditioning that differs, thereby altering the flavour profile and increasing the alcoholic content. Deep gold in colour with a mealy, malty nose. There was a degree of sweetness to the palate with a baking spice complexity - spiced rather than spicy. Smooth and very well balanced with a floral and malt loaf character to the long, semi-dry finish. This would be ideal with mature cheese or a selection of hearty Belgian pâtés. A gueuze is a traditional Belgian beer, a blend of young and old lambics which are bottled and aged for a further two to three years to produce a drier, fruitier more intense brew. Because the young lambics are not fully fermented, the blended beer contains fermentable sugars that allow a second fermentation to occur, producing CO2 and carbonating the beer. Brasserie-Brouwerij Cantillon was founded by Paul Cantillon in 1900, and it has long been the sole remaining brewery within the city of Brussels. In its first 114 years of operation, the only major change to production methods was a switch to organic ingredients in 1999. In true traditional style, Cantillon makes lambics from two thirds malted barley and one third unmalted wheat which are spontaneously fermented in open topped, attic-mounted vats, aged in oak barrels, blended, bottled and then refermented in bottle for a year. This combination of blending, carbonation through secondary fermentation in bottle and wine-like complexity of flavour has resulted in the nickname of “Brussels Champagne”. Gueuze makes up half of Cantillon’s production and these beers are remarkably age worthy, apparently improving (or becoming even stranger, depending upon your perspective) for up to twenty years. Fourth generation brewer at Cantillon, Jean-Pierre Van Roy, has owned the company since 2011. The gold colour was about the only aspect of this beer that wasn’t a surprise. The nose had a sweet, sour and spice character that really reminded me of tomato ketchup, with a fruity, funky, wild and acetic edge thanks to the work of Brettanomyces and all sorts of other yeasts and micro-organisms. The palate was very dry, not hoppy but tart and appley - almost cider-like - with a faint savoury, saline quality. This absolutely needed to be served with food; a ploughman’s lunch would have been ideal. Unexpected, totally bizarre and rather divisive - I have to say that I really quite enjoyed it, although I’m quite happy to admit that this could have been my perverse streak getting the better of me! I have to commend Matthew for selecting a very interesting cross section of styles of Belgian (and Belgian-inspired) beers. It is unlikely that I would have tried many of these of my own accord and I greatly enjoyed them all. When I drank them again subsequently the Piraat and the Westmalle were just as good as I remembered them to be, and I even confirmed to myself that I actually did really enjoy the wild, challenging Cantillon when I ordered it recently in a local Belgian beer bar. Not only will I be drinking these beers again in the future, I've been inspired to try similar styles of beer from Belgium and from around the world. Try Hanging Ditch for most of these beers, but I've recently purchased the Cantillon Gueze from the excellent The Beer Emporium in Sandbach where you can also sit and enjoy a bottle of anything that takes your fancy. For a great night out, head to the Belgian Bar and/or Pi (Altrincham) - they are within metres of one another - and grab a bite to eat in the excitingly refurbished Market House between the two. My tips are the amazing wood-fired oven pizzas from Honest Crust, baked delights from Wolfhouse Kitchen or a meaty treat from Tender Cow. Keep the beer theme going by washing it all down with a pint of something interesting from Jack In The Box or visit my good friends at Reserve Wines and try a glass or two of whatever they have on offer.